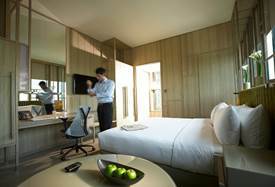 Through a readers’ poll conducted by the leading Business Traveller magazine, PARKROYAL on Pickering has been awarded Best New Business Hotel in Asia Pacific 2014 by Business Traveller subscribers. The Business Traveller Awards 2014 cover 57 categories and identify the very best in the hospitality industry. Since opening last January, the multi-award winning property has amassed many accolades, including being World Gold Winner of the FIABCI World Prix d’Excellence Awards 2014 in the Hotel Category as well as a BEI Asia Award winner for Asia Green Buildings Award in Retail Hospitality sector. This latest coup affirms both the property’s comprehensive business offerings as well as its delivery of the highest service standard. 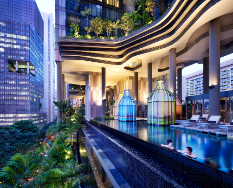 Celebrate with a stay at the Best New Business Hotel in Asia Pacific and treat yourself to a luxurious escape to PARKROYAL on Pickering for The Suite Life! This is the ultimate staycation package with indulgent extras, turning an average weekend into a mini-holiday within the city. 2 x 60-min massage treatments at St. Gregory’s per stay – your choice of Indonesian Balinese, Japanese Shiatsu or Aromatic Body Bliss. Prior booking is required for spa treatment at Tel: +65 6809 8870.